Unfortunately, there is not one definitive way to simultaneously destroy all kinds of weeds, so often struggle with weeds is painful and long. But there are many tried and tested methods that are sure to be able to help you! Any cottager and gardener is inevitably faced with the problem of weeds that grow in the area. Weed control for each of them starts with the selection of the most efficient way. Many gardeners one of the main roles assign digging the ground in spring and autumn. If you are looking for a way to get rid of weeds effectively, it is what you need. In the autumn, after harvest, try to dig as deep as possible, about 30 cm. the roots of the weeds while carefully collect, so you make it harder for them new germination in the spring. If in a few years to repeat a similar procedure, the weeds will be much less. If you are bored in the summer every weekend for the weeding on the plot, it is possible to apply the method, accelerating the process. On that site, which is littered with weeds, plant peas. When I collected his harvest, pea stems need to be on the same bed buried in the ground. In mid-fall on that place sow the seeds of winter wheat and rye, as thicker. Level the soil with a rake. In spring, the seedlings will germinate, and by the middle of summer will turn into a green carpet, which will not give the weeds to grow. With the advent of autumn, the dig site pitchfork, also burying the stems in soil. If you want to find a way to get rid of weeds forever, then check this method too. Of course, it's quite long, but the garden will bring a double benefit. First, the soil will be able to relax, and secondly, you will effectively get rid of weeds! 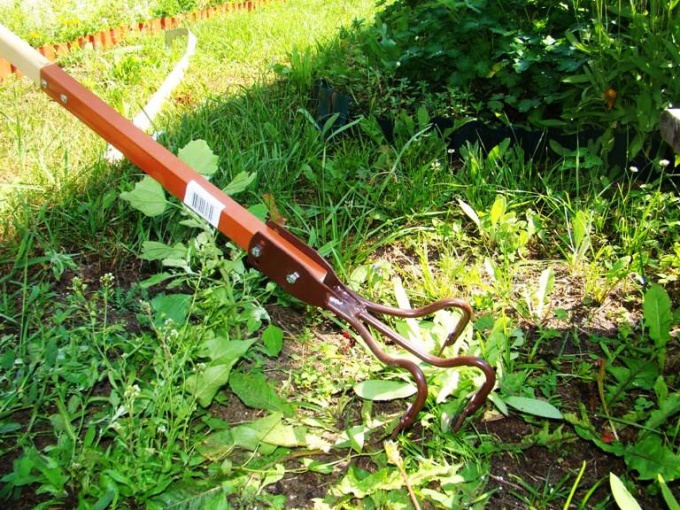 Many gardeners with experience know how to destroy weeds in the garden natural and quick way. The entire area is covered in a certain deck, which prevents the penetration of sunlight. Accordingly, it does not give the weeds to germinate. To do this, use thick cardboard, black tape, a special covering material, black in color, straw, sawdust, pine needles, etc. In order for the weed control was more effective, combine several methods. For example, cover the ground even with a transparent film, and the top cover with straw or any other mulch. Effective material think black agrotextile. It can pass water and air, and the sunlight there. But before you try out this method for the first time, carefully pre-propolice weeds and then cover with soil. The coating should be well secured. For this purpose you can use stones or bricks, which are arranged around the perimeter. alcohol. In the ratio of 1:10 with water to spray the garden a month before planting. It is also worth noting that the weeds can not only bring harm, but good. They can serve as compost fertilizer. To do this, they are best dried and burned, and after digestion to scatter on the site.